Gstaad illustrated posters and postcards take us on an enchanting journey through space and time. Vintage postcards and posters are becoming more and more popular, gaining consideration as valuable artworks as well as remarkable expressions of their time. The old Gstaad illustrations, with their elegant and timeless flair, seem to capture the real essence and charm of a magical Swiss holiday experience. Idyllic landscapes, winter sports and summer activities, luxurious hotels and facilities, flawless infrastructures, genuine food and local traditions: our region has been providing its unique features to visitors from all over the world for many years. 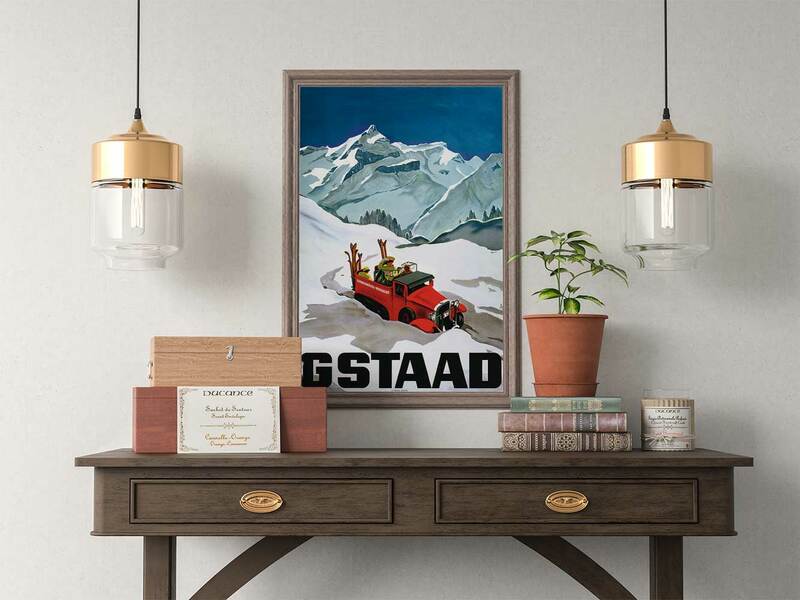 Vintage posters and postcards provide a glimpse of Gstaad and Switzerland as it used to be, the glamorous charm of its past enhancing the preserved beauty of the present. The Swiss tourism illustrations have a long tradition and have a prominent place in the international graphic design history: no other nation has such a great collection of posters advertising the beauty of its territory. This graphic tradition has a lot to do with Switzerland’s vocation to tourism, which developed increasingly since 1882, when the inauguration of Gotthard Tunnel opened up access to the Alps and created conditions to attract tourism to regions that were no longer far away. The expansion of infrastructures, with the construction of modern hotels, new mountain railways and cable cars, and the establishing of the first tourism offices helped make Switzerland a leading country in the early days of the tourism industry. In the late 19th century, national institutions such as the Swiss federal railway SBB and the local tourism offices started commissioning posters and postcards to advertise areas of the country or special events, working with famous artists and graphic designers, who created captivating images of the landscape. In the early 20th century these illustrations became more and more popular, with illustrated posters and postcards displaying bold colors and a smooth, expressive linear style, influenced by the Japanese woodblock prints and by artists such as Hokusai and Hiroshige. After World War I, the touristic development in exclusive resorts such as Gstaad, St Moritz and Zermatt continued to attract visitors and in the meanwhile sporting activities started to gain more relevance. As a result, the representations on posters and postcards were not anymore only centered on the picturesque landscapes. Sports were widely celebrated: human figures became the new protagonists. Men and women, in their elegant outfits, skiing, ice-skating, hiking, biking, swimming; children were often featured, their freshness and joy adding an emotional value to graphic communication. Illustrations also displayed cars, roads, trains, railways and bridges, presenting to the international visitors the image of a modern, developed country. Graphics were functional: clean, refined and inventive lettering and typography clearly expressed the message and enhanced the content. The outstanding print quality and attention to detail ensured a picture-perfect result. The elegance and beauty of these illustrations hasn’t faded through the years, their charm is still intact; the bright colors, the original type design and the fluid lines capture the eye, conveying to the viewer a sense of wanderlust and the bewitching sensation of being part of an enchanted world. The magic is still here.